Leslie Budewitz is a woman of many passions. After thirty years as an attorney, she wrote a guide for writers about criminal law and courtroom procedure, which won the 2011 Agatha Award for Best Nonfiction. Then she decided to combine two of her passions, food and great mysteries, by writing a series of cozy “foodie” mysteries. In 2013, Death al Dente, the first Food Lovers’ Village Mystery, won an Agatha for Best First Novel, making Budewitz the first author to win Agatha Awards for both fiction and nonfiction. Her latest novel, GUILTY AS CINNAMON, has all the elements of a great cozy mystery—quirky characters, a unique, well-realized setting, and plenty of conflict. And did I mention the food? 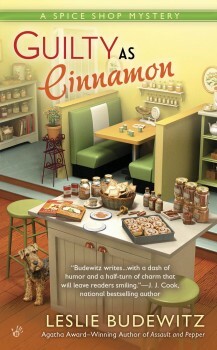 In this second Spice Shop Mystery, Budewitz’s knowledge of and love for cooking shine through. Five pages in, spice shop owner Pepper Reece describes a process for making a “gorgeous, fiery, red-orange oil” by heating ground dried peppers in oil and straining the oil off. Despite my lack of the domestic gene, I could hardly wait to try it myself. The Montana native has a heart for service. She serves as president of Sisters in Crime and is a founding member of the Guppies, the SinC chapter for new and unpublished writers. She generously agreed to answer a few questions for us about her work. Can you tell us a bit about your writing journey? I started writing at 4, on my father’s desk. Literally—I did not yet understand the concept of paper. But while l always wanted to be a writer, I didn’t actually think it was something you could do—so I became a lawyer instead. In my late thirties, I decided I really did want to write seriously, though it took more than fifteen years before I held my first book in my hands. In the interim, I wrote several unpublished manuscripts, although a few were agented and came close, and published half a dozen short stories. After Books, Crooks & Counselors: How to Write Accurately About Criminal Law and Courtroom Procedure (Quill Driver Books, 2011) was published, I decided that as much as I love helping other writers get the facts about the law write—er, right—I wasn’t through telling my own stories. I love the light-hearted subset of traditional mystery sometimes called the cozy, and decided to try that genre. How did you come up with the idea for the Spice Shop mysteries, and what makes the Seattle setting perfect for a mystery series? I fell in love with the Pike Place Market as a student at Seattle University in the late 1970s. Later as a young lawyer working downtown, I tried to eat my way through the Market at least once or twice a week. I’d browse the newsstand, buy a slice of pizza, sip a cup of Market Spice tea, watch the fishmongers throw salmon and amuse the crowd with their comedy routine, do my weekly shopping, and end with dessert—a hazelnut sablé from the French bakery, or a Nanaimo bar from a now-departed shop in the warren off Post Alley. So when I thought about setting a series in Seattle, the Market was an obvious choice. I created my own spice shop, influenced by existing shops and shops I’ve visited elsewhere, but with a flavor all its own. The Market is the perfect setting for an urban cozy, because it is a city within a city—a place with its own rules and regulations, but more importantly, its own culture and community. It’s an incredibly vibrant place, constantly changing, and full of characters. Tell us a little bit about Pepper Reece. In what ways is she like you? Pepper is the poster child for the adage “life begins at forty,” and I don’t mind admitting that it describes me, too. She dove into retail after her marriage ended and the law firm where she’d worked in HR, managing staff, imploded in scandal and took her job with it. She tossed her office wardrobe, cut her hair, and bought the Spice Shop, a forty-year-old institution that had lost its verve. She’s also got a wonderful loft in a century-old downtown warehouse, and in Assault and Pepper, inherits a dog. Her ex is a bike cop on the Market beat, so he’s still around. The fieriness that gave her the childhood nickname has mellowed, but when she’s on the trail of a killer, watch out! She’s loyal, creative, and adventuresome, traits I think we share. And we both love to cook, eat, and read mysteries. What are some of the challenges involved in writing a cozy series? The biggest challenge is finding stories that the protagonist can drive, so that she is a natural part of the investigation. Amateur sleuths and law enforcement essentially run parallel investigations, but the amateur’s probing is focused on the community and built on her insider position and knowledge. Those are very different stories from those involving professionals, like police officers or prosecutors. She doesn’t have access to search warrants or fingerprints; she’s got to rely on her networks, her ability to ask questions, and her ability to see what isn’t readily apparent. And she’s got to be appealing and realistic. I think it’s critical to keep your protagonist growing, to make sure she has an emotional transformation in each book—because readers are at least as interested in our characters’ emotional journeys as in what happens. Secondary characters are a lot of fun, but they can take over if you aren’t careful. What’s your writing process? Is it different for fiction and nonfiction? Heck, it’s different for every book! I am a planner, and I do outline each book—but it all stems from the characters. Planning the book is, for me, a right-brain process of discovery, a great, messy time that involves moving between every screen on my computer as I try to figure out what each character wants, what they’ll do when they don’t get it, and how to keep it all moving. Nonfiction, frankly, is much easier. What inspired the plot for GUILTY AS CINNAMON? So many different things! I knew I wanted to explore the Spice Shop staff relationships and show Pepper struggling a bit with certain aspects of her business. She’s no longer confident in her personal judgment when it comes to romantic relationships, so I wanted to delve into that. I knew that Tag, Pepper’s ex-husband and a bike patrol officer, does not get along with one of the homicide detectives; this book gave me a chance to find out why. As in all my books, but especially the Spice Shop series, there’s an underlying social justice issue as well. And I wanted her to have fun with that dog! Do you create all the recipes in your books yourself? Who taste tests them? Many are family favorites; others are new recipes chosen for that book. Each Food Lovers’ Village mystery involves a festival; the recipes allow readers to recreate the festival at home, and also to enjoy some of Erin’s and her mother Fresca’s favorites. In Death Al Dente, a recipe contains a clue, and in Crime Rib, a recipe is part of the killer’s motive. Each Spice Shop book focuses on a particular herb or spice that the shop is featuring that month, so several recipes focus on that ingredient as well. Some are inspired by Pepper’s finds in the Market, like the Potato and Broccoli Frittata in Assault and Pepper. Occasionally, I’ve discovered something so wonderful I wanted to share it, as with the Negroni cocktail in GUILTY AS CINNAMON. They are all much tested and tasted in my home kitchen. Only yummy recipes that the average person can make in the average home kitchen, with ingredients she can find and equipment she’s likely to have, make the cut. To expand a bit: Learn to read like a writer. Study the writing craft. Don’t rush into publication before you’re truly ready—impatience never helped a book. Develop a tender heart and a thick skin. Cultivate friendships—create your own community. Find joy in the work, and let that pull you forward. As a president of Sisters in Crime, can you tell us something about how being active in professional organizations like SinC can help writers? Writing is a solitary activity, yet every opportunity and accomplishment I’ve had as a writer came because of something I learned or someone I met in a group. Belonging to a national organization like SinC helps writers keep the drive to write alive during difficult patches. There’s so much information out there about writing and publishing—too much to sort out by yourself. When we walk into a gaggle of mystery writers—who are among the kindest, most generous and welcoming people I’ve ever met—many of us feel like we’ve found our tribe. Writers cannot do what we do without readers. Thank you, for your love of books, your passion for story. Few things make me happier than hearing from a reader who enjoyed one of my books, and I know other writers feel the same. So don’t hesitate to drop us a line or post a review—those small gestures help us know we’re on track, creating characters and telling stories you love. Leslie Budewitz blends her passion for food, great mysteries, and the Northwest in the Seattle Spice Shop Mysteries and the Food Lovers’ Village Mysteries, set in Jewel Bay, Montana. Death al Dente won the 2013 Agatha Award for Best First Novel. Her guide for writers, Books, Crooks & Counselors: How to Write Accurately About Criminal Law and Courtroom Procedure, won the 2011 Agatha Award for Best Nonfiction, making her the first author to win Agatha Awards for both fiction and nonfiction. She is vice president of Sisters in Crime, and lives in NW Montana. 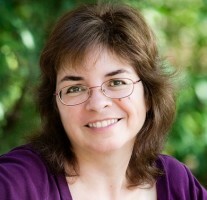 You can connect with Leslie through her website and blog, or on Facebook.